In Frankfurt, Annette and I are members of a group of wine and food aficiniados that meets about once a month in a top restaurant. In January, we had dinner at Biancalani. There were eight of us. We had 13 bottles of 9 different wines. We all had 5 courses. We spent Euro 140 including tax and tip per person. Biancalani has a menu with 10 items on it (Corso al Gusto). The standard is that you choose 5 items for Euro 70. Each additional item is Euro 10. If you want less, you can also eat a la carte for Euro 15 per item.There are about 20 seats and an open kitchen. You can watch Chef Christoph Kubenz and his team prepare your food. Chef Christoph Kubenz is a Juan Amador disciple. All his career, Juan Amador was a Michelin-starred chef, including at Restaurant Amador in Langen the south of Frankfurt/ Germany with 3 Michelin stars and more recently at Restaurant Amador's Wirtshaus und Greißlerei in Vienna/ Austria with 2 Michelin stars. Chef Christoph Kubenz cooking is obviously influenced by Juan Amador in that dishes are plated in a precise and transparent manner to let the main product be in focus. Christoph Kubenz at SchauMahl along with André Rickert at Weinsinn were among the first to showcase bistronomic cooking in Frankfurt. 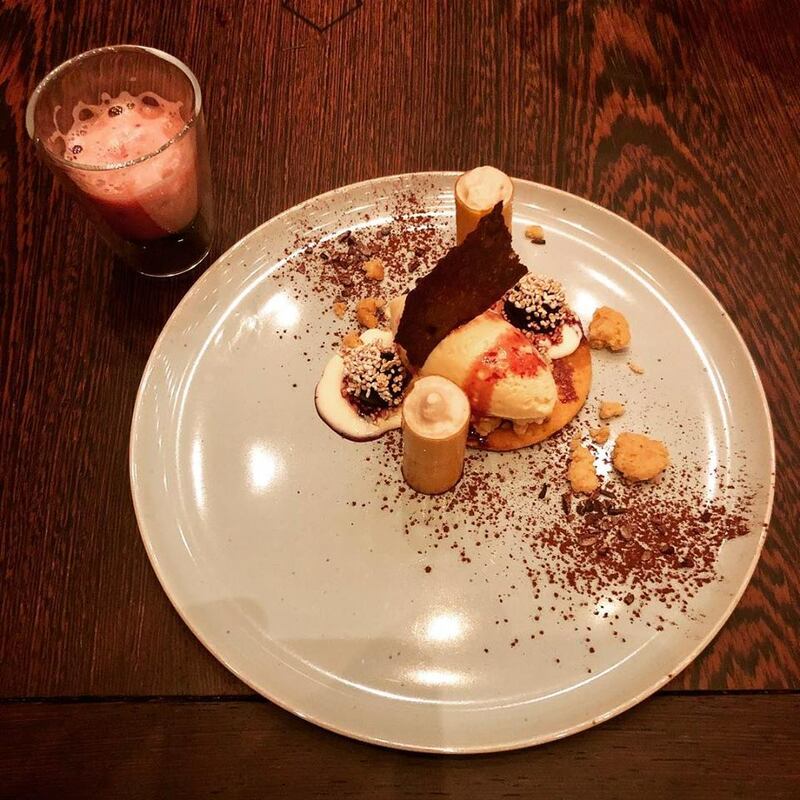 Christoph Kubenz is among the best chefs in town. For a long period, he was the Chef at SchauMahl in Offenbach, where he earned 15 points in the Gault Millau. In mid-2017, Chef Christoph Kubenz re-opened Biancalani and was immediately awarded 16 points in the Gault Millau 2018. That put him in the top 10 league in Frankfurt, with Lafleur (18 points), Carmelo Greco, Français and Lohninger (17 points), Erno’s Bistro, Gustav, Weinsinn and Schaumahl in Offenbach (16 points). 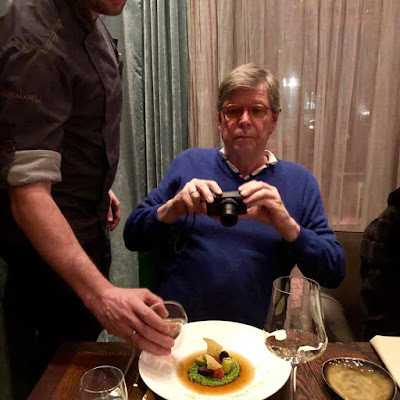 With Carmelo Greco and Lohninger, Biancalani was in the group of restaurants that were downgraded in the Gault Millau 2019. The standard is that you choose 5 items for Euro 70. Each additional item is Euro 10. If you want less, you can also eat a la carte for Euro 15 per item. We had 12 bottles of 9 different wines. We programmed the dinner to end at midnight, when Johnny turned a year older. A few other people showed up for Johnny's birthday and we partied for another 2 to 3 hours. While the other three estates are all considered to be at the world-class level (and are VDP members, the association of about 200 German elite winemakers), Weingut Siener is a step below with 3/5 grapes in the Gault Millau WeinGuide 2019. Most of the wines are sold at the winery itself with exports accounting only for a small part of the output. 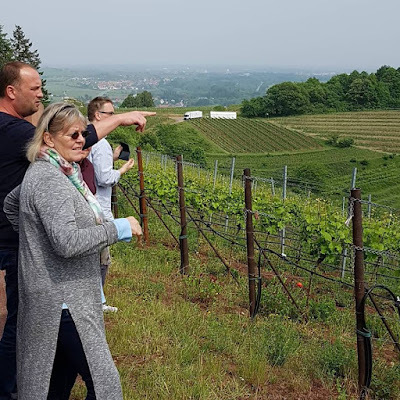 Against this backgound, Weingut Siener produces most interesting, highly sought, high quality wines at a price point below that of the other three producers we visited in the Pfalz. Peter Siener's wines are like him character heads, occasionally a little stubborn, but unmistakable, with a lot of backbone and always worth the patience. Power, acidity and length mate in a variety of ways in his wines, with freshness and tension. Peter Siener is as deeply-rooted in Birkweiler as his vines are rooted in the soils of the foothills of the Palatinate mountains. Besides his passion for his wines Peter Siener also loves cooking and is passionate about food. That explains the grip and power of his wines that are perfect to match with food. Peter Siener was our host. The visit started with a glass of Weingut Peter Siener Sekt. Peter then took us on a tour of the famous Kastanienbusch and Mandelberg vineyards. We then sat down with Peter Siener in the courtyard of Weingut Siener for a Riesling Kastanienbusch and Pinot Noir Kastanienbusch vertical tasting comprising 5 vintages. Denise Siener served delicious local food from the Pfalz. For three generations, the Weingut Siener has been all about family and wine. Peter and Denise and their daughters Paula and Helena live in a traditional Winzerhaus in Birkweiler. Peter Siener is the third generation owner and winemaker at Weingut Siener. He took over from his father in 2000 and has since stepped hard on the accelerator to pursue quality with a vengeance. He also doubled the vineyard site and has holdings in two of the best vineyard sites of the southern Pfalz: the Kastanienbusch and the Mandelberg both in Birkweiler. Since Peter's entry into the winery, new approaches have been taken in reducing yields, developing wines and marketing, with great recognition and much success.. He belongs to the generation of the young, energetic winemakers in Germany who follow new paths to only produce the best of the best quality. Today, the vineyard are totals 15 hectares in the single vineyards Kastanienbusch and Mandelberg (Birkweiler), as well as Sonnenberg (Leinsweiler). They are planted with the white varieties Riesling, Pinot Blanc, Pinot Gris, Chardonnay and Silvaner, as well as with the red varieties Pinot Noir, St. Laurent, Cabernet Sauvignon and Merlot. The Siener wines are produced in 4 lines: Literwein, Gutswein, Erste Lage Wein and Grosse Lage Wein. Bottle-fermented sparkling wines (Sekt) are also produced. The winery is a member of the Vereinigung Südpfalz-Connexion and of FAIR'N GREEN. Peter Siener: By becoming a member of FAIR'N GREEN, we want to have our sustainable production certified, which translates into more transparency for our customers and even more sharing and control at every step in our work, and we believe it will optimize our operations in many areas - our contribution to environmental protection and social responsibility. In terms of exports, Weingut Siener wines are available in Switzerland, Norway, Holland and Hong Kong (at Chilled Wine). Chilled Wines: Siener - The Grape Whisperer. Peter Siener’s wines are a reflection of his own personality – generous, swinging, and thoughtful – wine is not just a product to him, and making it is not a job; he is ‘Vintner at Heart’. That’s why he is only fully satisfied if the quality exceeds his own expectations, ensuring that good can be better and better can be best. Sophistication and distinctiveness are things that usually fade with time, but the taste of Peter’s wines makes each moment everlasting. Birkweiler is a winegrowing village in Pfalz, Germany. Although not one of the region's more celebrated villages, a handful of the Riesling wines made here are world-class, and Birkweiler's Spätburgunder (Pinot Noir) is also beginning to attract international attention. The classic Birkweiler wine is a ripe, flavorful Riesling with notes of pear and peach and a streak of minerality. The village and its vineyards are located at the foot of the low-lying Haardt mountain range, in a particularly sunny, sheltered position between two shallow valleys. The climate is typical of Pfalz, significantly warmer and drier than surrounding regions thanks to the rain shadow cast by the hills just to the west. There is sufficient sunshine and warmth here to grow olives, almonds and chestnuts – crops more often associated with southern Europe. This fact is reflected in the names of Birkweiler's two Grosse Lage vineyards, Kastanienbusch and Mandelberg, which mean "chestnut bush" and "almond hill", respectively. The third crop mentioned there, olives, is honored in the Olberg site in Konigsbach, a village a little way to the north. The Kastanienbusch vineyard holds a commanding position overlooking Birkweiler. At an altitude of 1000ft (300m) above sea level, it is one of Pfalz's higher wine estates. Because the site is situated higher up on the Haardt slopes, the geology here is distinct from that lower down. The soils on the site's upper half (known as Kastanienbusch Köppel) are characterized by a kind of red slate unique to this area. These southeast-facing slopes, which enjoy breathtaking views down the valley, produce some of the Pfalz's finest Riesling. The lower section of the vineyard has weathered sandstone with significant limestone deposits, and is planted almost exclusively to Spätburgunder. The Mandelberg site lies to the southwest of Birkweiler. Weissburgunder (Pinot Blanc) flourishes in the soils here, which are rich in limestone formed from ancient marine fossils. Ample sunlight hours and the heat retention provided by stones in the vineyard ensure maturity for all wines grown here. There are other vineyards named Mandel-something, most notably Himmelsreich Mandelpfad in Dirmstein, Mandelberg in Kirrweiler and Mandelgarten in Gimmeldingen. After the vineyard tour, we drove back to the estate and sat down with Peter Siener in the courtyard of Weingut Siener for a Riesling Kastanienbusch and Pinot Noir Kastanienbusch vertical tasting comprising 5 vintages. Denise Siener served delicious local food from the Pfalz. The tasting is covered in a separate posting.